There’s just something about sitting in a toasty warm ice house in the middle of winter, waiting for that lunker to nibble on your hook. Maybe it’s the sense of peace and relaxation, or maybe it’s the anticipation of what just might come up through that hole in the ice. Ice fishing. It’s a rite of passage for any true Minnesotan. And on Lake Mille Lacs, it’s about as good as it gets. Whether you’re after the mighty Lake Mille Lacs walleye, northern pike, or pan fish, be sure to check the DNR’s fishing regulations for current limits and the Mille Lacs fishing reports for hot spots. 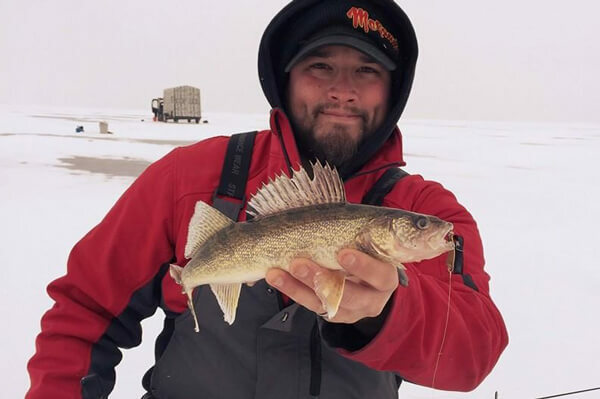 November: In excessively cold Novembers the lake has frozen over by Thanksgiving, but normally the ice fishing activity starts around the first week of December near shore and in sheltered bays. Mid-December: The lake is usually frozen over by the middle of December, and freezes all the way across by late winter, with ice sometimes 3 feet thick. Plowed lake roads provide easy access on and off the lake. March: March usually signals the start of melting season. On Lake Mille Lacs, the DNR allows spearing of northern pike, tullibee, and rough fish including bullheads and suckers. Darkhouses, which are typically lighter than regular ice houses, block all outside light, allowing spearers to easily see the bottom of the lake through a large hole in the floor. Ice is cut using a chainsaw, usually around three feet by five feet, and a hookless decoy is used to attract fish. Then the wait begins. Northern pike are the most sought-after fish among spearers on Lake Mille Lacs. 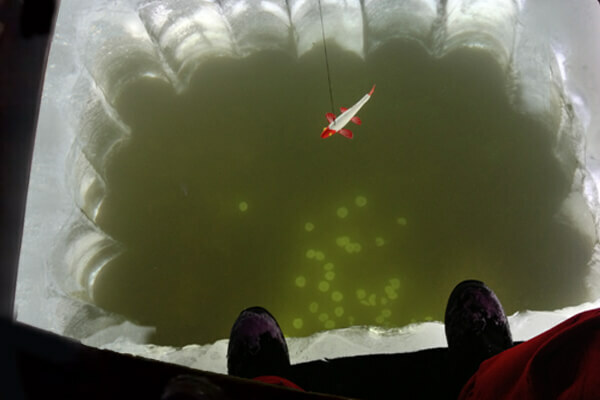 Check the DNR’s current spearing regulations, including limits, here. In recent winters, the number of ice houses on Lake Mille Lacs has exceeded 5,500. But don’t worry, as one of the largest lakes in the state, there’s plenty of room for more. There are even many Mille Lacs ice house rentals and darkhouses available, and can be rented in half-day increments. Furnishings vary from the bare minimum to a home away from home, with gas heaters, cook stoves, tables, chairs, bunks, separate bathrooms and/or nearby satellite toilet facilities. The houses, and all the fishing equipment anyone would need is available to rent, so even those not well-versed in Minnesota ice fishing can join in the fun. Check out Mille Lacs ice house rentals and darkhouse rentals. And remember, Lake Mille Lacs has plenty of ice fishing guide services to put you right on the hottest fishing spots — no hassle required!